Accessories are a must for the 4th. Anything red, white and blue will do, and the best part is you really can't overdo it. Try your local dollar store for any cute outfit add-ons! Tip #2: Drinks On Us! Why limit the festivities to only your outfit? The party continues with what's in your cup. Start off with pouring cranberry juice in a glass that you can easily see through. 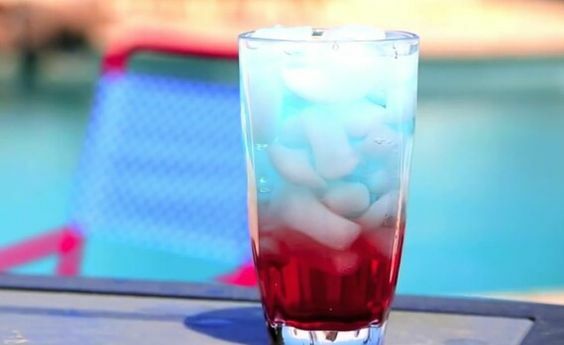 Fill the glass up to where you want the red color to end, then add ice to the top. Next, add sprite for your white color. Last, pour some blue gatorade to top it off and viola! You've got yourself a festive drink for the day. Basically any red and blue candy will do. 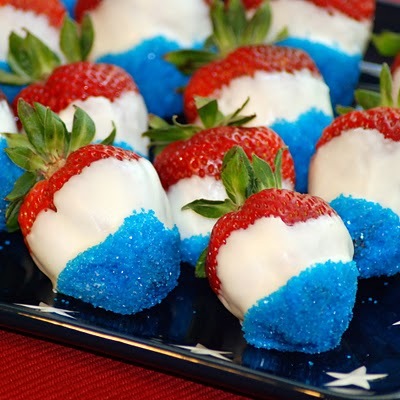 One of my all time favorite Fourth of July snacks are red, white and blue chocolate covered strawberries! Start out with rinsed strawberries. Dip them in white chocolate, then dip the tip of the strawberry in blue colored sugar. Let em dry and you have some patriotic treats. Whether you head to the beach, the park, or a backyard barbecue, spending it with the people you love reminds you of everything that the day is about. Sit back, put your feet up, and enjoy the show. God bless America, amirite? P.S. check out my best friends' social media!